WAR WITH RUSSIA This Year? What are the fundamentals upon which a study of the Hebrew or Greek text must be based? The first and fundamental principle is very simple: God has told us in the Bible that He has indeed revealed His will to man by (1) inspiring men to write or say certain things; and (2) to have it preserved. 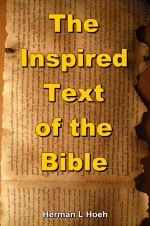 In short, the concept is that all scripture is given by inspiration of God (II Tim. 3:16)! One of the biggest proofs of the existence and power of God is the fact that there is a true Church consisting of converted people — that you are here in Ambassador College! I think the biggest miracle is the conversion of anybody — a lot more difficult than moving the earth out of its orbit! The earth, after all, is just physical; it doesn't say, "No sir, you're not going to move me!" But the human mind can answer back! So our first premise is that there is a God who reveals His secrets to men and who has committed His Revelation through the Bible by divine INSPIRATION. Divine inspiration really makes good sense when we realize we're going to be members of God's Family! God is to be OUR Father in the sense of us personally getting acquainted with Him. He has even spoken to us in advance through the Bible when He tells us what He would have told us had He been here in person! Our second basic premise is that God has caused the Bible to be providentially preserved down through the ages. We should differentiate between "providentially" and "miraculously." The term "miraculous" has reference to elements that are not normally involved in physical or human affairs. "Providential" means that God works out, in ways that we do not see, a series of circumstances that leads to the same result — the result that He wants. Thus "providential" means that we don't directly see God intervening in nature which can't be otherwise accounted for, but where a series of events leads to the result He wishes to achieve. To summarize: First of all there is the matter of the inspiration of the Biblical record, and second the providential preservation of that record. Now, with these two basic premises in mind, we would logically expect that the Old Testament would have been preserved by those people in whose language it was originally given! This is the simplest, most logical, and most likely result: The people to whom the revelation is given, who understand the language, are the people who will preserve it. You really cannot preserve something like the Hebrew Bible intelligently when it comes to copying if you can't understand the LANGUAGE. Try to copy a language you don't understand and see how many errors will immediately creep in! The point is that God did choose a particular people to whom He revealed His will. These are the people about whom we read in the Bible that "unto them were committed the oracles of God" (Romans 3:2).... to understand the difference between sceptre and birthright is to understand why Judah and not Israel preserved the Bible. To understand who multiplies it, you go to the birthright — it takes money to multiply it: the printing press, related facilities, established nations. Now we also read that God was going to commit this information to the Gentiles. The Jews had turned aside and therefore, Paul said, "I go to the Gentiles." He did give the message to the Gentiles and God inspired the New Testament to be written in Greek! So we would logically and consequently expect the Greeks to preserve it. If the Jews preserved what was written in Hebrew, why should not the Greeks have preserved what was written in Greek? That is exactly what happened! What text have the Greek people preserved for the New Testament? — the "Byzantine." In the Western world the Protestant form of that text is called the Textus Receptus, which is essentially the same as the Byzantine except for a little Latinization here and there and late Greek spellings. The Greeks as a people have within their national and religious body, a whole series of manuscripts that is available to the scholarly world. If the Greeks had not preserved it, there would not even have been a Greek Bible available until Tischendorf and Griesbach and others uncovered manuscripts. In fact, if the Greek Bible is not the New Testament God inspired to be preserved in Greek, then the New Testament in Greek was lost, and we only had the Latin. And only when Tischendorf, for instance, went to Sinai and was looking in the waste basket, could the Western world have recovered the Greek New Testament — which doesn't make sense! Remember that another basic premise in our study is that the text must be publicly available and preserved in the community which does the preserving, whether Jewish or Greek. In other words, anybody could have gone into the Greek world at any time and had the Biblical record. We don't have to wait till the 19th century to listen to Tischendorf! The foregoing material is the basis for our study. This is the trunk of the tree. And it is all summarized in Lesson 12 of the Correspondence Course. Be sure to study it. How do we know the Dead Sea Scrolls should not be the standard? The key, of course, is that the Dead Sea Scrolls were not publicly preserved. They weren't available. If they were God's revelation then they were hidden from the world until that Arab boy stumbled into the cave! But God made this His policy: Whatever he has not chosen to reveal is His; but that which He has chosen to reveal "belongs to us and to our children forever" (Deut. 29:29)! By contrast, the Dead Sea Scrolls were buried for 1900 years! Lost! God's revelation has not been! There are all kinds of proofs to show that understanding of the Old Testament preservation is a prelude to understanding the preservation of the New! Now, in the same way, we can recognize these Essenes and other heretical sects were not a part of the main stream of the Jewish community. These sectarian movements were not once recognized by Jesus, and they were certainly not preserving that material which the Masoretes preserved. So, with the Dead Sea Scrolls we are not confronted with the same problem that modern scholarship will have to hurdle. For us the Dead Sea scrolls mean nothing! They are no more than some variant that has no bearing on the subject no matter what it reads. It represents whatever heretics are inclined to do — to twist the scriptures to their own point of view! Now, in what community do we find the inspired Greek text has publicly been preserved? Answer: In the Greek community in general — with Mount Athos as are ligious center, or Athens, or Constantinople. Mount Athos was more a center of the multiplication of the text of the Greek world. Next: Have the variants in the Greek text been available and publicly circulated all this time? Has the Alexandrian and the Western text been available in Greek and publicly circulated in the same way that the Byzantine has? No! They have not been available, but rather unused, forgotten, unknown, uncirculated! There are two major areas of deviation from the Byzantine text. The one used by the scholars to replace the Byzantine is the Alexandrian. Hort also called it the "Neutral" text. A codex is a manuscript in book form — with leaves. They are designated by capital letters. Codex B, or Codex Vaticanus is a manuscript, "A" is the Codex AlexandRINUS, "X" (Aleph) is the Codex Sinaiticus. A manuscript is a hand-written copy of a document. The text is the material contained in the manuscript. The Alexandrian text, though Greek, was preserved in Egypt — named after the city of Alexandria. What does God say about Egypt? Right! Egypt is a type of sin and we're to flee from it! Christ came out of Egypt; Moses fled Egypt; The Children of Israel left Egypt. You can go on and on and you will note how many people have had to come out of Egypt! This should have been a warning to the scholars. The Greeks in Egypt, unlike any other place in the world, were the most important grammarians and hence their approach to the text was critical. The Alexandrian text gives every evidence of suffering more from a critical analysis of the various readings. Alexandria was the center of critical scholarship of that day! Therefore it was, like Germany, the unsafe area for preserving Scripture. The Greek Septuagint was the first translation of the Hebrew text. It was done by Hellenized Jews in Alexandria, Egypt! The Jews themselves recognized in their day that the Septuagint represented an early form of the Bible but, a heretical form with false readings. Some Hellenistic Jews were far more inclined to be paganoriented than they were in Palestine. Next: What other name is applied to non-Byzantine readings other than Alexandrian? The Western! Why do scholars use the Alexandrian and not the Western as the standard text type in competition with the Byzantine? Because they saw clearly themselves that there were so many variations within the Western that they couldn't produce a text. The Western text was not a critical solution trying to resolve problems of divergent reading; it was an intentional fraud. The Western is impossible because, for practical purposes, almost every manuscript is a text unto itself! A perfect quote — "a text unto itself!" When you have this, how can you decide — when you have whole chapters deleted or added? That's far different than mere phraseology where you tend to choose what you think might be better. Whereas, although there are many variations in the Alexandrian — please note — many variations, but sufficient uniformity that it entertains the scholars. There are a sufficient number of variations in the Alexandrian that you can never arrive at the right answer, but you can always get something that is an approximation — and scholars like that! That's the "scientific" approach. It must not be exact, but it must be potentially resolvable — "enough to keep us employed!"